← Tonight is “First Friday” in Downtown West Chester! West Chester PA — Richard Hancock, a representative of the US Postal Service, made a presentation to the West Chester Council on February 19 to introduce a proposal to sell the existing Post Office at the corner of Gay and Walnut Streets in downtown West Chester and relocate postal services to another downtown location. The downtown Post Office services the 19380 and 19381 ZIP codes. 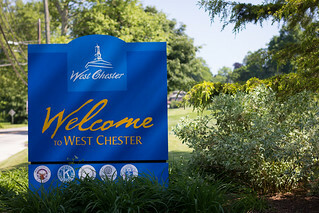 Immediately after the presentation, members of the West Chester BID, including myself, met with Mr. Hancock to assure him that the BID will provide every assistance to find a suitable new location within the downtown. The West Chester BID has been monitoring this situation since December, 2011, when rumors of selling the Post Office arose. It was agreed that the relocation will be as close to the original location as possible. There will be no interruption of postal services during this transition. The acquisition division of the Postal Service will be looking for a space of about 1,600 square feet that provides parking and the ability to load and unload postal trucks. There is now an appeal period through April 7, 2014. Details of the appeal process may be found in the lobby of the Post Office, 101 East Gay Street.